ABOUT: An adaptation of F. Scott Fitzgerald’s 1925 novel of the same name, the film is co-written and directed by Baz Luhrmann, and stars Leonardo DiCaprio, Tobey Maguire, Carey Mulligan, with Joel Edgerton, Elizabeth Debicki, Isla Fisher and Jason Clarke. It follows the life and times of millionaire Jay Gatsby and his neighbor Nick, who recounts his encounter with Gatsby at the height of the Roaring Twenties. I believe that this film uses the iconic Gatsby story as a backdrop *gasp* and that style is the main focus here. Texture, colour, lavish sets, costumes…pretty stunning excess. I also believe that this film should not be compared to other Gatsby films rather it can be looked at as a Luhrmann work. As a Luhrmann work this is one of his worst. Critic A.O. Scott says, “The result is less a conventional movie adaptation than a splashy, trashy opera, a wayward, lavishly theatrical celebration of the emotional and material extravagance that Fitzgerald surveyed with fascinated ambivalence.“ I did not expect restrained or conventional anything. I expected a great reflection of over-the-top-ness. Gatsby and his world are metaphors for excess, melodrama and a c’est la vie sensibility. The ‘Jazz Age’ had a very unconventional and rebellious attitude. African Americans were credited with starting the Jazz Age. Flappers were significant because they represented the new, free, voting woman. Many ‘youth’ of the day were rebelling against what they perceived to be an antiquated system and belief structure. Baz Luhrmann does ‘excess’ very, very well in most of his films. In fact, I cannot think of a better-suited director to make this film. The story itself has been criticized, so either you go with it or you don’t. Is the story about true love? Does Daisy really love Gatsby? I dismiss these questions. Daisy is caught between a philandering, bullying husband and a needy, stalkerish boyfriend. She has to negotiate the repressive ideology of the era and her family’s expectations. To me, she is the sanest one. The film is a “great, tragic love story with action, passion, drama”, said director Baz Luhrmann to the Hollywood Reporter. This film is largely style over story. Even so, there is loose editing and weak acting. There were some scenes that had heightened colour, texture andmise-en-scène. These were great. For those in need of a refresher, here’s a quick recap of the plot: drawn to New York by his new job in the bond business, Nick Carraway moves to Long Island, where his neighbor Gatsby holds lavish parties in the hopes of winning back Nick’s cousin, Daisy, a beautiful debutante with whom he had a romance before the Great War. Nick agrees to have both Gatsby and Daisy to tea. Daisy and Gatsby soon rekindle their affair, but upon being pressured to renounce her husband, she retreats from both men. Tragedy intervenes. Somebody I saw the film with noted that today there were no Cary Grants or Gary Coopers and that a gravitas was lacking in DiCaprio. He evolved in Django and devolved here. He probably has the best range today but in this film, not so much. She’s wrong but was by far the best actor here. “The thing is that Daisy is trapped in a cage of the previous century but there are all these wild-partying flapper girls around,” Luhrmann said of the paradoxes. “What Carey can’t say,” Luhrmann said, “is that we went on an intense research journey together and Carey went down to Princeton and we had experts on speakeasies come in. Luhrmann said, “And when Carey (as Daisy) says, ‘I wish I had done everything on Earth with you,’ it’s a line from Zelda Fitzgerald’s love letter to (Fitzgerald). She was okay but not great. According to U-T San Diego online, the movie’s soundtrack is meant to invoke the feeling of the 1920s. This film does mirror the era sensibility but it is a flawed film. Introduction: Opposition – Romy has always been contrary so she feels ideas in this book are quite consistent with her personality. Chapter 2: Perchance to Dream – The nature of certain dream’s ability to unlock the mystery of a past life is dealt with. Chapter 3: Together – How we remain with the same groups of people. Chapter 5: Chances – Opportunities to develop and explore various circumstances are written about. Chapter 6: Curious Occupation – Various interests that Romy had are investigated. Chapter 7: Readings – some psychic readings Romy gave are offered. Chapter, is coined. Resonating with our species is considered. Chapter 11: Shifts and Fluctuations – How does one deal with change? Chapter 12: A Matter of Bodies – Do we ‘choose’ the body we have? Chapter 13: The Space Between – Where do we go between lives? Chapter 14: Time – A complete re-visioning of the flow of time. Chapter 15: Knowledge and Lessons – Lesson’s gained from Life and their import. Chapter 16: What? –The nature of questioning and questions is examined. Epilogue: About – A summary of the book and a summing up of many meanings. I cannot think of permanent enmity between man and man, and believing as I do in the theory of reincarnation, I live in the hope that if not in this birth, in some other birth I shall be able to hug all of humanity in friendly embrace. I have been contrary all of my life. I rarely did or said what was expected. Honestly, among most of my peers I am the mildest. I am not extreme in appearance or attitude but how I think is out of the ordinary. As usual, I am not about changing minds; I am about integrity in the face of opposition. If I try to be honest and truthful and if what I say belies one’s belief-system, I feel I am like a mirror – one can see who they are or who they are or are not in me. I do not need anyone to agree with me or believe what I believe. I am not trying to convince anyone of anything. I am simply writing my truth. I love writing and I adore this subject-matter, reincarnation, but I am very aware that it is considered controversial. The thing is – controversy never stopped me. I am so willing to “push the envelope,” I am willing to go the distance. Once I had an affair with a gay man. No, he was not bi-sexual, he was gay. Confused? Since then, he has been in a relationship with another man for more than ten years. I got flack from gay and straight people. Did that stop me? People have a very difficult time with blurred definitions. I understand that people need to believe in categories. At times these categories resonate with one’s behaviour and at times they do not. I believe these categories are often constructed, a fiction: Possibilities and options are limited – ways of being are limited. Obviously, many people do resonate with their definitions. To stretch our minds is good. At times certain definitions just do not fit. If my actions made my life harder or if they would prevent me from carrying on, I am not sure what I would do but I have been blessed with a constitution and life-force full of fortitude. I am very resistant to opposition, I am very strong. Not thinking or believing what other people do is habit. I tend to resist what most consider the norm. That is why I can write this book. In many ways, I am preaching to the converted and in many ways, I am in complete opposition to fundamental beliefs. I am more about layering codes than dichotomies. What that means is, I prefer blending realities rather than separating them. To me, nothing is cut and dried. There are no absolutes. No givens. If someone is hoping for a black and white definition of reincarnation, I highly doubt they will get it. To me, partiality reigns. All I know is that there are glimpses and fragments of knowledge. We are not privy to the whole picture. We are accordingly limited by our senses. To find evidence of this, look at various animals and their realities. The world of the fish in the fishbowl is the fishbowl. All it knows is some “hand” feeding it. This could be magical or omniscient to a fish. The fish is severely limited by its environment, senses, etc. So moving on from this, I understand that I can only know so much. I am a fish in a fishbowl. I am limited and any quest of mine is circumspect. I can explore the unknown, the mysterious, other notions. I can observe the hand that feeds me, my fishbowl. I can know a warped reality, a skewed perspective. I do not believe in concepts that invoke ideas of the real, the solid or the secure. Things that are shaky or wobbly feel more appropriate. I enjoy stability in my life but I am unfazed by change or difference. I find the qualities that involve the so-called strange appealing. I know that some people find my attitude kooky or weird. Being set-apart or anomalous is great to me. I prefer the fringe or edge. Tremendous power resides in deciding to be oneself – whatever that entails. It might be very contrary to others and it takes strength and courage to own one’s truth. Bravery exists in many different areas. It can be small – a child in the playground standing up to a bully, – or large, like Martin Luther King, Jr. Personally, I truly believe that standing up for oneself has great value. Putting oneself in harms way because of a decision to manifest integrity can, and often is, a real possibility. I believe the alternative is worse. Challenging dominant ideas is fraught with danger. It might just be easier to surrender, to be defeated, but where is the fun in that? The decision to own power is, well, powerful. I keep thinking of Rosa Parks: “…an unknown seamstress in Montgomery, Alabama refused to give up her bus seat to a white passenger. This brave woman, Rosa Parks, was arrested and fined for violating a city ordinance, but her lonely act of defiance began a movement that ended legal segregation in America, and made her an inspiration to freedom-loving people everywhere.” Power, inspiration and possibility: Incredible. We can all make a difference. Just because one’s life may feel ordinary, it is important to know that we are capable of the wondrous. A decision not to give up a seat can change thoughts, attitudes and ways of being; ways of understanding. A small gesture can lead to a revolution. We are all capable of impacting others and we are meaningful beyond our current or obvious circumstances. It might be impossible to see the big picture; so we need to follow our guts and hearts. Recently, I was seated to eat near the kitchen in a restaurant. I am currently disabled and in a wheelchair. My mother said it reminded her of segregation. I will never let this happen again. I will insist on being seated elsewhere. An out of sight, out of mind mentality will not apply to me. That this mentality by others continues to pervade is astonishing. Are you aware in the early-to-mid 1900’s it was illegal to be “found ugly” on the streets of some mainstream American cities like Chicago, Illinois (Chicago Municipal Code, sec. 36034) and Omaha, Nebraska (Unsightly Beggar Ordinance Nebraska Municipal Code of 1941, sec. 25) and Columbus, Ohio (General Offense Code, sec. 2387.04)? Your punishment for being caught (in) public ranged from incarceration to fines of up to $50.00 USD for each ugly offense. No person who is diseased, maimed, mutilated or in any way deformed so as to be an unsightly or disgusting object or improper person to be allowed in or on the public ways or other public places in this city, or shall therein or thereon expose himself to public view, under a penalty of not less than one dollar nor more than fifty dollars for each offense. The goal of Ugly Laws was allegedly to preserve the pretty facade of the community. The disabled, the indigent and the poor were a part of society, but nobody wanted to deal with them and fewer still wanted to actually look at them. So laws were passed to keep the deformed — especially those with Cerebral Palsy and other disfiguring diseases — inside and out-of-sight. The way I think and the way I look now will just have to be dealt with. Book is available to order online. 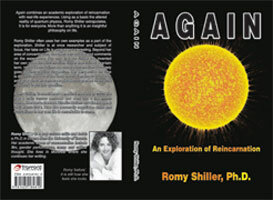 Again (ISBN: 978-1-4251-8481-0 ) combines an academic exploration of reincarnation with real-life experiences. Using as a basis the altered reality of quantum physics, Shiller extrapolates. It is for everyone. More than anything it is an insightful philosophy on life. Reincarnation is an interesting concept. To Romy Shiller reincarnation is both entertaining and scholarly. Shiller brings together various sources on reincarnation. Psychic abilities are the so-called “icing on the cake.” Shiller often uses her own examples as a part of the exploration: In this case we are talking about subjectivity. Any distance or objectivity is absolutely questionable. Shiller is at once researcher and subject of focus. Shiller philosophizes what she has come to know. Her take on Life is unique and interesting. Shiller’s perspective adds something valuable rather than detracts or takes away from reincarnation. Beyond her area of concentration, Shiller often extrapolates and comments on the experience. Not only that but Shiller has invented her own rules for reincarnation. Shiller has coined certain terms like species-jewelry and her take on distinct aspects of reincarnation absolutely goes against popular suggestion. Shiller aligns quantum mechanical ideas with reincarnation. Her perspective on Time should make a few people uncomfortable. Ideas of the body are challenging to the reader and go against what most people take for granted. The nature of History is put into question. How Shiller personally negotiates shifts and fluctuations in her own life is remarkable to some. In the midst of an eclectic career as a Toronto writer, academic, actress and Communications Director for an animation school, Romy Shiller was diagnosed with a brain tumour and lapsed into a post-surgery coma that lasted five months. She finally emerged from the darkness stricken with Akinetic Mutism-a partial paralysis that made it very difficult to move or talk-but still possessed her enthusiastic intellect and zest for life. One of her team of doctors and physiotherapists called her survival a “medical mystery,” one she sought to explore during her painstaking rehabilitation. Typing with “one bent finger,” Shiller created her previous book You Never Know: A Memoir (Trafford Publishing), her musings on illness, rehab, pop culture, dreams and psychic phenomena. Applying her unique philosophy to her new physical reality, Shiller is a witty, fascinating and inspirational guide through life’s most severe twists. Like a mirror, Shiller hopes to reflect back to each person reading Again what is possible. We can overcome what seems like odds stacked against us. When one feels like they have no choice, find out what you do have available. Before her brain tumour diagnosis, Shiller enjoyed an offbeat career. A pop culture critic, she wrote articles for magazines as diverse as FAB and Canadian Theatre Review. Having studied drag for her PhD in Drama, Shiller enjoyed performance and had acted in a television series on YTV called System Crash. 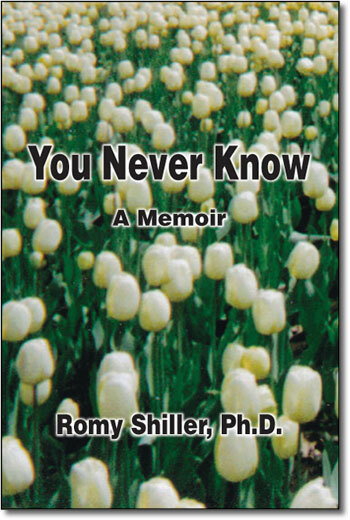 More about Romy Shiller: In addition to having a PhD from the University of Toronto, she has an MA from there as well. Her BA is from McGill. One of her articles has been translated into Italian and is used to teach a University course on Communications. A separate article is taught at the University of Lethbridge in Alberta. It has been chosen to be included in a book. She has been on the same course syllabus as Simone de Beauvoir. In the fabulous book Third Wave Feminism and Television by the head of women’s studies at South-Carolina University, Romy Shiller is heavily quoted as a third wave feminist. MONTREAL – Romy Shiller was a fit, health-conscious woman, held a PhD and a creative job she loved, and valued her independence. In 2003, she was diagnosed with a non-malignant, but life-threatening brain tumour. Surgery was naturally risky, but she was told she would likely be back at work in 15 weeks. Shiller came through the eight-hour operation at a Toronto hospital, but a few days later, following a procedure to ease drainage, she lapsed into a six-month coma. Doctors told her parents to prepare for the worst. After gradually regaining consciousness, she could not speak for weeks more and survived on a feeding tube for 11 months. Five years later, she still has major physical disabilities (a word she does not shrink from). She uses a wheelchair, the left side of her body is weak, movement on the other side is difficult to control, speech does not come easily, vision in her one sighted eye can be wonky, and care must be taken in chewing and swallowing. Shiller has just published a memoir You Never Know, a frank and good-humoured account of her long road back to some semblance of normalcy. She reveals a fatalism that has granted her the serenity to accept – more or less – what has happened, while determinedly working to regain as much as she can. Her resilience and positivism have surprised her. She hopes her example will help others coping with disabilities and illness, as well as change the attitudes of the well and able about what makes a life worth living. “I know my current situation is quite dire to many people, and I have left quite a bit behind, but the alternative is harsher. I am here, and no matter how yucky it gets, this is so much better to me than nothing,” she writes. Writing the book was a labourious task, not because she found it hard to find the words, but because she could type with only one finger, and a bent one, at that. She had been a writer on pop culture before getting sick. After years of hospitalization and rehabilitation and then living with her parents back in her hometown of Montreal, she recently moved into her own apartment, managing with the aid of full-time attendants. She continues to work daily with a team of therapists. Her sharp intellect, memory and lively personality are intact. Shiller insists she is not angry or depressed about her situation. In fact, she calls herself blessed and finds that she laughs now more than she ever did. And she is not on any mood-enhancing medications, she notes. “I am not always happy, but I do manage,” she writes. Shiller knows she is lucky to have parents, Lillian and Bryant, who are able to provide for her emotionally and materially (the memoir is dedicated to her mother who was at her bedside daily while she was comatose), two supportive brothers and a circle of good friends. Although not religious in the strict sense, her Jewish identity and knowledge of her maternal grandparents’ Holocaust survival give her strength. She is a believer in prayer and psychic phenomenon. Shiller, a single woman, was always unconventional; her dissertation was on theatrical drag. She had an open mind about the off-beat. She muses that this understanding of what it means to be marginalized may have helped her to adjust to her condition today. She impishly refers to herself as being in “disability drag”, but pain underlies the self-deprecation. Her message is serious: don’t judge people by their physicality. She is frustrated by how she is often misperceived, even by those who mean well. Too many think her mind must be as impaired as her body. She senses the condescension and discomfort. Romy decided to launch You Never Know in a public venue and, though it was a trial, to speak there. A percentage of the sale of You Never Know will be donated to the Brain Tumour Foundation of Canada. Intense headaches sent Shiller to a Toronto hospital in 2003, where she was told that she had a brain tumour. Doctors soon performed surgery to remove it. After an additional operation to drain fluids collecting in her brain, Shiller descended into a five-month coma. When she awoke, she was afflicted with Akinetic Mutism, a partial paralysis that made it difficult to speak or move. Shiller progressed slowly, first squeezing her mother’s hand and then blinking. Her first post-coma word was “no.” Before the coma, Shiller had earned both a master’s degree and doctorate in drama from U of T, studied voice at the Royal Conservatory of Music and performed “female to female drag” with The Greater Toronto Drag King Society. No Choice: Introduction: an overview of what happened to Romy and how she felt. James-Paul:or Jamie was a close friend of Romy’s who died six months before her surgery. He was an MD and he asked her to be his spiritual adviser-a non-religious endeavor. The Wormhole: Deals with the death of Romy’s grandfather, that her grandparents survived the Holocaust, her Jewishness, the corridor she used to take in the hospital to where she said her first word. Blank: Deals with the coma. Before: Before she went into the hospital Romy did many things, visited lots of places, and lived in Paris, France; Montreal, Quebec and Toronto, Ontario. Queasy: Her take on ‘resistance’ and how she moved to Montreal to live with her parents. Que Sera Sera: What the future holds for Romy Shiller. What you are about to read happened to me. I try to make no excuses. I am a big believer in personal responsibility. Did I choose to get a brain tumour? No, I did not. But I did react to it. I am pretty sure it is an unconscious kind of thing. I really did not think of myself as a particularly happy person before the surgery. I am quite pleased with my response. On the whole, I was quite positive. I still am. I might get depressed in the future. If I do, I do. For now, I do not sit in dark corners, feel sorry for myself or take drugs. I laugh constantly. Maybe this is my disposition or constitution. Who knows? All I know is that I survived an ordeal of huge proportions, I am still surviving and, for many reasons, I am truly grateful. This is not to say that physically I do not wish that I were back to the way I was. It would be so much easier on many levels. It is very difficult for me to look in a mirror. In my mind’s eye, I look (and sound) as I did before and, to be perfectly honest, I prefer that to what is in the mirror these days. It may be superficial, but that’s how I feel. Of course, I can choose to see beauty on the inside, but it would seem I don’t. That would be rational and even logical, especially at this point. So, you see, I know how difficult “choice” is. So many people say I am an inspiration to them. I am conflicted about this because I never set out to be an inspiration. I did not cut off my own limb to save myself like that guy Aron Ralston did. I am no Lance Armstrong, who continues to inspire everyone who knows about him. They obviously did not set out to be inspirational, but they are. And in my opinion, they are mega fantastic. I watched Oprah and saw two disabled guys who inspired me. As a result, I had a good dinner with my sister-in-law’s dad, Bert, and his wife, Karen. They had not seen me since before the surgery. For me, watching this show was synchronistic. I made it personal, and it worked for me. I think awareness is key. Anyhow, I have food in my belly and shelter over my head. For these reasons and more, I consider myself truly lucky. It is by no means easy, but at least I don’t have to worry about the basics. If this had to happen, I am in pretty fortunate circumstances. I always feel encouraged; there seem to be many possibilities for me. This is a definite bonus. I was never scared or frightened. I am still more interested in my condition than anything else. The interesting part was that I had very little or no control with regard to what happened. I had to give up the idea of control. This can be very liberating. It seems like I am a “glass is half full” – type of person. In any case, I really believe most of this stuff is intuitive. Like I said, maybe it is just my nature, but I simply felt this in my gut. I made the phone calls I had to make and I let nature take its course. This is not to say I was ever fatalistic – I asked many questions about my surgery – but I could do nothing about the tumour inside my brain. I had two lawyers help me with a living will and a will. You never know. Weirdly enough, I also made plans in case I went into a coma. I assumed some part of me would “hear” stuff and I made my mom promise to read to me from my favourite book at the time and to play my music. She did. I remember nothing of this. I am told I laughed or rasped appropriately at the punch lines of certain jokes at a time when I was still in the coma. I wish I could remember the jokes and the laughter, but I do not. Then again, I have a picture of myself at four years old at a birthday party I do not remember, at a house I do not remember. Even in late January, when I was out of the coma, there was an event that I absolutely have no memory of. Someone whom I know quite well came to visit me. Apparently I was quite vivacious at the time and I recognized her. So, for me, memory has little to do with consciousness. I was certainly perceptive at all these times, but the jury is still out on the specific meaning. It is difficult for me to use a pencil or pen, so, in a sense, this book is my journal. It really never felt cathartic though; it was not a release, maybe because I am still dealing with my new physical repercussions. My handwriting is incredibly problematic now and my letters look very childish. In the very beginning of rehab, I could barely write by hand at all, so even this is an improvement. I really enjoy the process of writing, so the book was more of a compulsion – something I had to do and wanted to do. Maybe this book justifies what I went through and what I am still going through. In many respects, it hardly matters to me as long as it is beneficial and not detrimental to me. I typed out my entire book using one bent finger. This was much slower than I am used to, and while it was a challenge, it did not feel daunting to me. I could really think about what I wanted to say because I had more time. I would get physically tired during this process, so I would stop and take breaks. I would do it again. Believe it or not, I simply would not let my present physical difficulties get in the way. I know it would have been very understandable just to stop; however, that is so unlike me. Also, outside of all the therapy I am doing, writing was a distraction. While my subject matter was about what I have to deal with now, there was a certain “project” aspect to it. I like projects. Although what I went through was quite unique, my story was never a subject for a book – although, of course, it has become one. I continue to live the story and I could guess the ending, but I would rather leave it unfinished. To be quite honest, I prefer stories that are open-ended. I know this bugs many people who would prefer closure, things neatly wrapped up, but what can I say? That part of my story is not written yet. In my case, it would be very satisfying to know the end. But I do not. I know what I would like to happen. Whether it does or does not, only time will tell. These are the cards I have been dealt – like them or not. I am glad that I can write this book, but I am a writer (amongst other things) so writing about what happened is second nature to me. I guess what I want you to know is that writing continues to be pleasurable to me. Even if I am not tickled about my physicality at present, at the very least there is that. I do not have a loving and knowledgeable partner in life to mediate on my behalf medically, but I do have parents and brothers with a vested interest in my health and welfare. I feel so lucky to have them. They were, and are, a great resource to me. When I was in the hospital, they were all quite extraordinary. Faced with an imminent challenge, they really stepped up to the plate. At times, I get ticked off. I am only human, after all. I do not want to be anyone’s mission, yet I find I am often people’s lesson. On an esoteric level, this is amazing; but on a physical level, I really do not appreciate it. I am not a so-called guinea pig. Lessons are interesting notions. I feel we can learn things vis-à-vis other people or situations. If I get hurt, however, that’s a different story. I have little tolerance for these kinds of mistakes. It becomes my lesson and I may not choose to participate any longer. For me, the idea of “choice” is a liberty I have here. Options are very good. The thing about esoteric lessons is how we choose to react to them. Personally, I love to see how this plays out in others. Sometimes I get quite disappointed, but this is about expectation, which I try to avoid. Expectations are so difficult to deal with: They are a major challenge. I was pretty ambivalent about getting my PhD Now I am glad I have it. I like being called Doctor, even though I am not a Doctor of Medicine. I learned a lot and I know it speaks to my dedication, stamina and skills in addition to my intelligence. Maybe I need this degree because of the preconceptions that go along with disability. It seems to stun people when they find out. I am more than willing to see rationalization in this now. I am so glad that I have this in my pocket, whatever the reasons I might use now. The degree is not only an identity, it is part of my personal evolution. I know that I have incentive enough to try to recover. Reminders, though well intentioned, feel insulting. And I do try, but I am also painfully aware of my physical limits at present. I believe I will overcome most of these in the future. Whatever disability remains, I will deal with. For me, there is no alternative; there is no choice. In addition to the earlier incidences, what you are about to read is where I am now. MONTREAL, PQ ( CANADA) – MARCH 18, 2008 – In the midst of an eclectic career as a Toronto writer, academic, actress and communications director for an animation school, Romy Shiller was diagnosed with a brain tumour and lapsed into a post-surgery coma that lasted five months. She finally emerged from the darkness stricken with Akinetic Mutism—a partial paralysis that made it very difficult to move or talk—but still possessed her enthusiastic intellect and zest for life. One of her team of doctors and physiotherapists called her survival a “medical mystery,” one she sought to explore during her painstaking rehabilitation. Typing with “one bent finger,” Shiller created her new book You Never Know: A Memoir (Trafford Publishing), her musings on illness, rehab, pop culture, quantum physics, dreams and psychic phenomena. Applying her unique philosophy to her new physical reality, Shiller is a witty, fascinating and inspirational guide through life’s most severe twists. Before her brain tumour diagnosis, Shiller enjoyed an offbeat career. A pop culture critic, she wrote articles for magazines as diverse as fab and Canadian Theatre Review and some of her articles were chosen to be included in university textbooks and courses. Having studied drag for her Ph.D. in Drama, Shiller enjoyed performance and had acted in a television series on YTV called System Crash. For doctoral research, she became a member of the very popular and acclaimed 90s performance art group called The Drag Kings where she did female to female drag. They were widely profiled in media such as Maclean’s Magazine, W Network, Xtra! to the Toronto Sun who ran a controversial photo spread – twice – of the troupe shot in the men’s dressing room of the Toronto Maple Leafs. She received a call-back for a lead role in Mamma Mia but was told she did not look old enough. Shiller had studied voice at the Royal Conservatory and with a private coach before that because she loved to sing. Romy Shiller is a pop culture critic and holds a PhD in Drama from the Graduate Centre for Study of Drama at the University of Toronto as well has a BA from McGill University. Her academic areas of concentration include gender performance, film, camp and critical thought. She was born and raised in Montreal, then lived in Paris then Toronto before moving back to Montreal where she currently resides. She speaks fluent French and English. Shiller’s inventive and uplifting book uses her illness, brain surgery and coma as merely the starting points for a sprawling discussion of time, reincarnation, quantum physics, pop culture and the nature of life itself. By sharing her story with candid insight, good humour and gritty realism, Shiller hopes to infuse people with hope. – Francisco Gregorio, physiotherapist, director of ERD Inc.
Romy Shiller began 2003 as an intelligent, vivacious and successful woman with a PhD in drama. Five years later she is the same talented academic with interests in pop culture, but has survived a sudden brain tumour and coma. She now has a speech impediment and is confined to a wheelchair, requiring a lot of assistance in daily life. She painstakingly typed this book with one finger, and that alone impresses me. In You Never Know, Romy segues between the story of her coma and recovery, her current life, and reflections on the nature of humanity, being a “cyborg” and more. She ia a trained singer, but now her voice won’t co-operate. She is not enamoured of her new appearance. Nevertheless, she remains a “glass half full” person. I think this is what struck me most, her incredible optimism and drive to continue making the most of life in spite of circumstances that would probably overwhelm me. The descriptions of her coma are fascinating – she remembers little of this time, but remembers dreaming and was apparently responsive at points. I imagine it would be helpful to anyone with a loved one in this circumstance, but she doesn’t dwell on the experience and the book moves back and forth through different parts of her life. She muses over death, Madonna, self-image, sexuality, her Jewish ancestry, romance, laughter and drag queens. This is no dry account of recovery, it’s these vignettes and meanderings which make the book particularly enjoyable. Since this was published, she’s published two more books. I look forward to getting into “part two” of her biography. Very interesting look inside the mind and how Romy thinks. I mean that in a much more profound way than her general thinking; more about the workings of the mind. This is a book about someone who really does “get it”, living the reality not just talking about it. She lives what she preaches. I found one paragraph particularly deja vu…that the secret is in quantum physics. Not sure if that was meant to be so revealing or not – but it was. Not a book for everyone but for those who enjoy a deep exploration along the edge of life and existence and think outside the box. I am glad it was written and I had the privlege to venture into Romy’s mind. Fascinating place and fascinating book. If I ever again start to feel that I or my loved ones are going through a difficult time I’ll just go back to this amazing story of Romy Shiller and recognize that it could be a lot more serious and scary. This young lady’s fight and survival against all medical odds is inspirational. The fact that she’s obviously a maverick and subscribes to Frank Sinatra’s philosophy of “My Way” has no doubt been and will continue to be instrumental as she keeps making progress. Romy Shiller is a competent, intelligent, sincere individual, who has not only survived from a serious brain tumor removal and long term coma, but has also demonstrated unbelievable strength and perseverance that has undeniably been her driving force during her recovery. Living each day to the fullest, with an open mind, she is truly an inspiration to myself, both personally and professionally. Romy Shiller, a medical mystery, not only tells the story of her brain surgery, lengthy coma and Akinetic Mutism, but she muses about reality, death, time, popular culture, psychic phenomena and dreams. She applies her previous interest and scholarly work on the body to her new physical reality. Her positive attitude and unique philosophy are truly inspirational. ‘You Never Know: A Memoir’ – Review of my book. As the reader, you are taken along on the journey with Romy. She allows you a glimpse into her life, past, present and hopefully her future. As you ride along you will laugh, cry and clap for this extraordinary woman. Her story makes you think hard about how precious life is and how it can change in a fraction of a second. Many would have crumbled under these circumstances but Romy Shiller rises to the occasion over and over agan. Watch Romy on CBC News: Sunday. This book is available to purchase online.